Download "The likelihood that students will"
3 Self-management is a form of metacognition, the act of thinking about how one is thinking. Examples of some key self-management skill areas include: awareness of one s current level of mastery and understanding (and misunderstandings) of a subject; the ability to reflect on what worked and what needed improvement regarding a particular academic task; the ability to persist when presented with a novel, difficult or ambiguous task; the tendency to identify and systematically select among and employ a range of learning strategies; and the capability to transfer learning and strategies from familiar settings and situations to new ones. Another important set of academic behaviors is student mastery of study skills necessary for college success. Important study-skill behaviors include time management, stress management, task prioritizing, using information resources, taking class notes, and communicating with teachers and advisors. An additional critical skill is the ability to participate successfully in a study group and to recognize the potential value of a well-structured study group. Time management is perhaps the most foundational of all the self-management and study skills. Examples of time management techniques and habits include: accurately estimating how much time it takes to complete all outstanding and anticipated tasks and allocating sufficient time to complete the tasks, using calendars and creating to do lists to organize studying into productive chunks of time, locating and utilizing settings conducive to proper study, and prioritizing study time in relation to competing demands such as work and socializing. 26 NEW ENGLAND BOARD OF HIGHER EDUCATION Contextual Skills and Awareness College knowledge consists of the privileged information necessary to apply successfully to college, gain necessary financial aid, and then, subsequent to matriculation, understand how college operates as a system and culture. 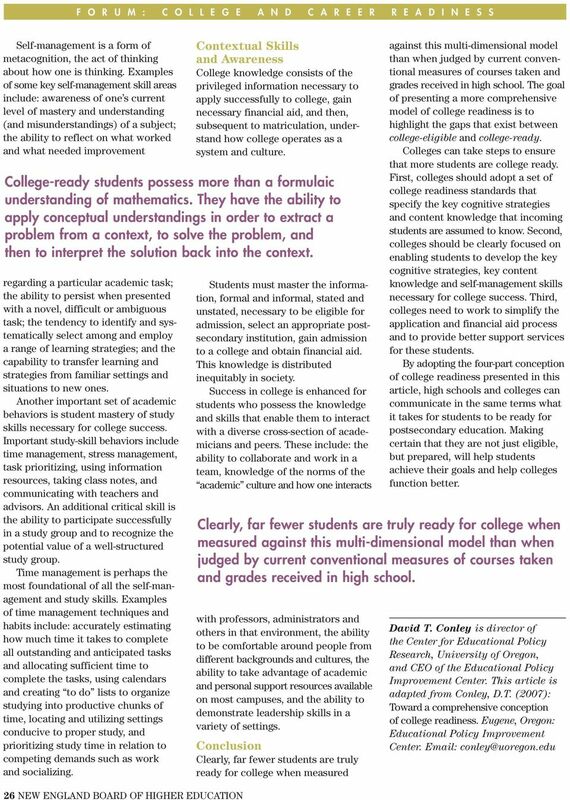 College-ready students possess more than a formulaic understanding of mathematics. They have the ability to apply conceptual understandings in order to extract a problem from a context, to solve the problem, and then to interpret the solution back into the context. Students must master the information, formal and informal, stated and unstated, necessary to be eligible for admission, select an appropriate postsecondary institution, gain admission to a college and obtain financial aid. This knowledge is distributed inequitably in society. Success in college is enhanced for students who possess the knowledge and skills that enable them to interact with a diverse cross-section of academicians and peers. These include: the ability to collaborate and work in a team, knowledge of the norms of the academic culture and how one interacts with professors, administrators and others in that environment, the ability to be comfortable around people from different backgrounds and cultures, the ability to take advantage of academic and personal support resources available on most campuses, and the ability to demonstrate leadership skills in a variety of settings. Conclusion Clearly, far fewer students are truly ready for college when measured against this multi-dimensional model than when judged by current conventional measures of courses taken and grades received in high school. The goal of presenting a more comprehensive model of college readiness is to highlight the gaps that exist between college-eligible and college-ready. Colleges can take steps to ensure that more students are college ready. 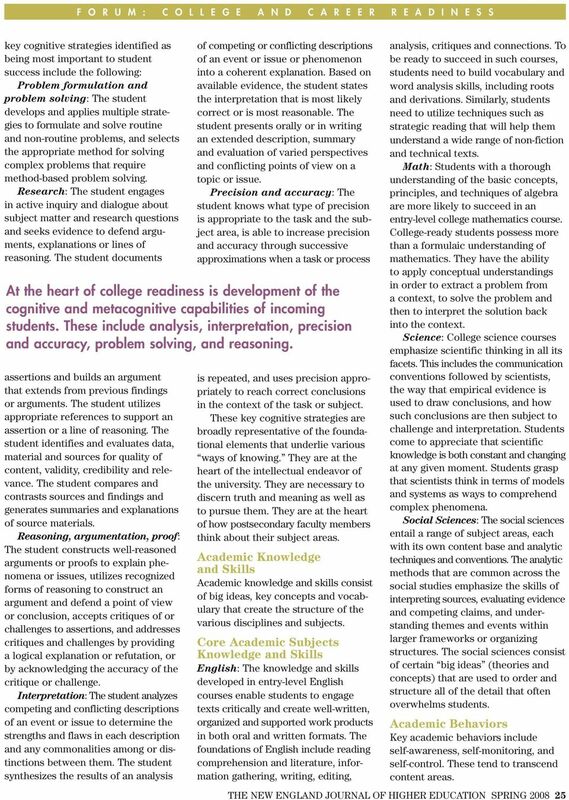 First, colleges should adopt a set of college readiness standards that specify the key cognitive strategies and content knowledge that incoming students are assumed to know. 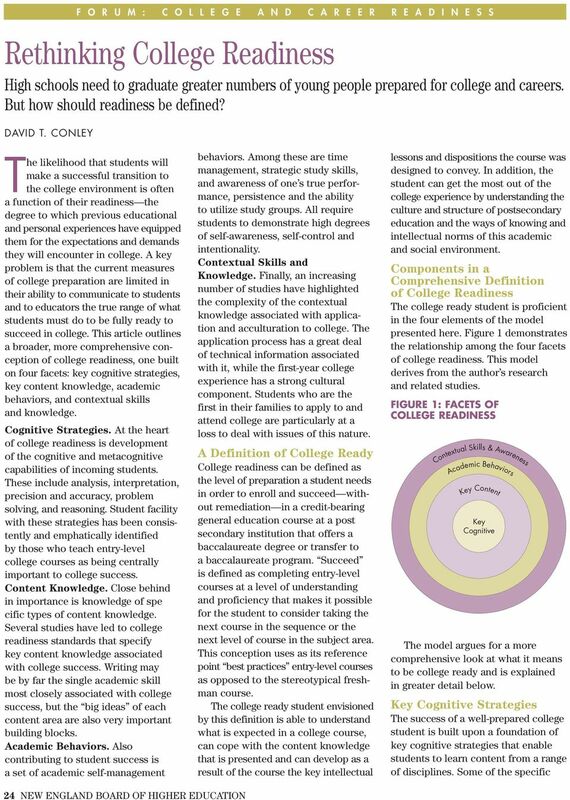 Second, colleges should be clearly focused on enabling students to develop the key cognitive strategies, key content knowledge and self-management skills necessary for college success. Third, colleges need to work to simplify the application and financial aid process and to provide better support services for these students. By adopting the four-part conception of college readiness presented in this article, high schools and colleges can communicate in the same terms what it takes for students to be ready for postsecondary education. Making certain that they are not just eligible, but prepared, will help students achieve their goals and help colleges function better. Clearly, far fewer students are truly ready for college when measured against this multi-dimensional model than when judged by current conventional measures of courses taken and grades received in high school. David T. Conley is director of the Center for Educational Policy Research, University of Oregon, and CEO of the Educational Policy Improvement Center. This article is adapted from Conley, D.T. (2007): Toward a comprehensive conception of college readiness. Eugene, Oregon: Educational Policy Improvement Center.